PRINCETON, N.J. -- Americans' concern about several major environmental threats has eased after increasing last year. As in the past, Americans express the greatest worry about pollution of drinking water, and the least about global warming or climate change. The results are based on Gallup's annual Environment survey, conducted March 5-8. Gallup trends on many of these items stretch back more than two decades. Last year's increased worry has proved temporary, with the current level of worry on each of the problems back to about where it was in 2013. Despite ups and downs from year to year in the percentage worried about the various issues, the rank order of the environmental problems has remained fairly consistent over the decades. Americans express greater concern over more proximate threats -- including pollution of drinking water, as well as pollution of rivers, lakes and reservoirs, and air pollution -- than they do about longer-term threats such as global warming, the loss of rain forests, and plant and animal extinction. The amount Americans worry about the various threats tends to rise and recede in unison, with concern higher in the late 1980s and early 1990s during the revival of environmentalism, and in the late 1990s and early 2000s amid the economic boom. Since then, Americans' worry has fallen, with concern dipping to record lows on most issues in 2010 or 2011. The current level of worry on each issue remains at or near those record lows. 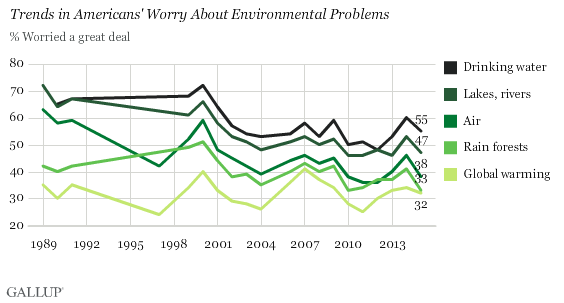 Consistent with the decline in worry about specific environmental problems, Americans have become more positive about the quality of the environment in recent years. If Americans perceive the environment to be in relatively good shape, it follows they would be less concerned about potential environmental threats to Americans. The more positive views about the environment could be the result of federal, state and local government's as well as individuals' actions to minimize potential environmental threats to U.S. citizens. The health of the economy may also be a factor in reduced worry about environmental problems. Americans tend to give environmental concerns higher priority when the economy is healthy than when it is ailing, and in recent decades the U.S. economy was arguably its strongest in late 1999 and early 2000. 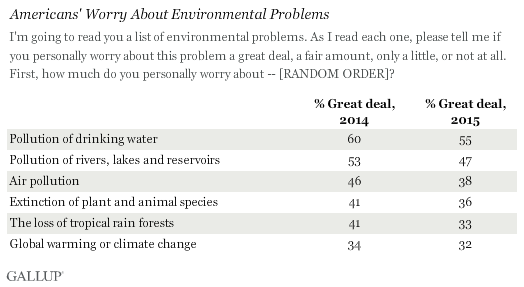 Also, the nature of the environmental agenda may indirectly be influencing Americans' concern. The primary focus of the environmental movement has shifted toward long-term threats like global warming -- issues about which Americans tend to worry less than about more immediate threats like pollution. Importantly, even as global warming has received greater attention as an environmental problem from politicians and the media in recent years, Americans' worry about it is no higher now than when Gallup first asked about it in 1989. A final factor is the politicization of environmental issues. This is exemplified by the sharp political polarization in views of global warming. 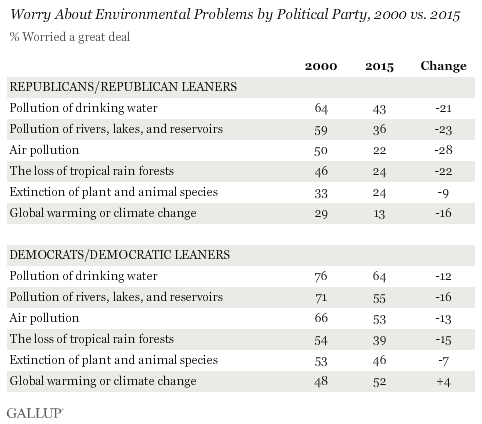 And although concern about environmental issues is lower among both Republicans and Democrats since 2000, it is down more among Republicans. Across the six issues measured in 2000 and 2015, the percentage of Republicans and Republican-leaning independents who worry "a great deal" is down an average of 20 percentage points, compared with an average 10-point decline for Democrats and Democratic leaners. Democrats worry more than Republicans about all of the issues. Notably, Democrats are more worried about global warming now than they were in 2000, perhaps reflecting the shift in the focus of the environmental agenda toward this issue. Americans' concern about a series of potential environmental threats remains on the low end of what Gallup has measured over the past 25 years. Last year's increased worry proved temporary, rather than the start of a trend toward renewed concern about environmental problems. That diminished concern has both positive and negative aspects for those favoring tougher environmental policies and regulations. The diminished concern may mean the policies and regulations in place are working to protect Americans from environmental threats. However, because of that, and because Americans are less concerned about environmental matters in general, they may be less willing to support policy changes to make those regulations even tougher if they don't perceive pollution and other environmental threats as imminent. Slightly more than half of Americans (52%) say President Barack Obama is doing a "good job" of protecting the environment. They are less likely to say he is doing a good job of improving the nation's energy policy (39%).